I commonly receive calls requesting a quote for a tree to be topped. I cringe each time I hear those words. Tree topping should only happen during Christmas. What is tree topping? What are the effects of tree topping? 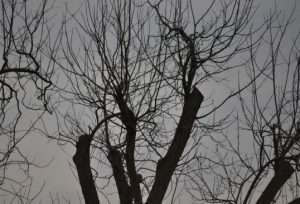 Why is topping of trees still offered as a valid service by some tree care companies? Why do some tree owners request their trees be topped? Are there any alternatives to tree topping? other trees are in full leaf. terms this means that the cuts are not made in the proper location to allow the tree to ‘heal’ or create woundwood to protect the exposed cuts and that too much of the leaves or ‘food factories’ are removed. possible creating cavities. When the nub does not dieback new growth called advantageous growth or ‘suckers’ will sprout below the cut. The suckers often have 5 to 7 sprouts per nub, are weakly attached, and grow very fast. The sucker growth is usually much thicker that the original canopy. This increase in density increases wind loading and can cause more limb failure than the limb that was cut. Decay often enters into the nub and creates hollow limbs that have less strength to support limb weight or wind load. When a large percent of foliage is lost on a tree, the tree reacts by drawing upon its stored energy to grow new leaves and branches. The stress that is caused by the loss of the leaves and the draw to grow new tissue can cause the tree to change the sugars that it produces from a complex chain to a simple chain of sugars. The change in the sugar or ‘food’ that the tree uses makes the plant more susceptible to disease and insects. Some tree care companies, and I use the term loosely, still top trees because of ignorance to the damage that it causes. Others top trees because they feel that someone is going to do it, so why not top trees and get paid. The third group, and in my opinion the worst group, knows that topping is harmful and prey on people for the future work of topping again or removal of the plant. the public about proper tree care and against tree topping. In almost 20 years of providing tree care services, I have slowly seen the practice of topping trees decrease. Unfortunately this is not happening fast enough. Now the good part, yes there is an alternative to tree topping. It is canopy reduction or thinning. 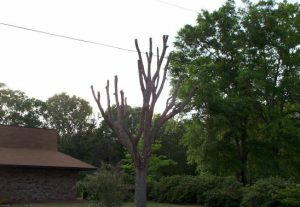 Canopy reduction is the removal of small select limbs at their attachment point, cutting limb tips back to a side limb about a 1/3 of diameter of the limb being cut, or removal of a complete branch. All cuts or wounds made to the tree are made at the limbs bark collar allow rapid growth of woundwood to cover the cut. Depending on the species of tree and its health, no more than 25% of the tree’s foliage will be removed. The tree is not stressed enough to create suckers or change its ‘food’ to a simple sugar. We offer educational sessions to garden groups, schools, and some not for profit groups for free. 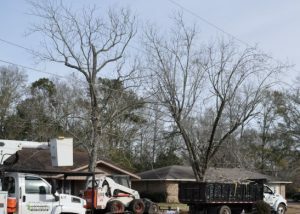 If you are interested in learning more about proper tree care, please contact Gary by email gary@ickestreeservice.com or by phone at 251-945-5144.